As expected, there's plenty of girlie stuff on her list. Ponies and princesses figure prominently. 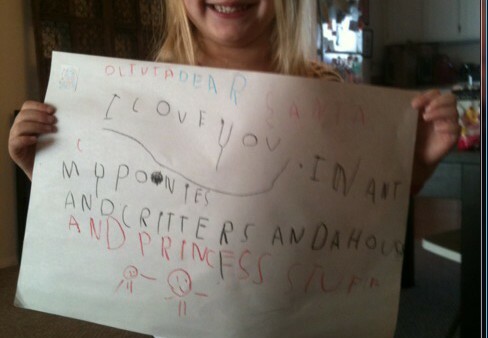 And she's been awfully nice, so chances are Santa will fulfill her wishes. Me? My wish list is pretty much checked off already. I have a happy, healthy kiddo who's having a blast playing with words. As a Mama writer, that last part is pretty cool. I have some jobs I'm digging big time, including local fashion and food beats for an online paper. I even interviewed Rachael Ray recently. I'm also plugging away on my book. (I know, I said I'd finish it in 2010. I didn't. But 2011 is my year. I can totally feel it.) And, I am blessed with the love of some truly spectacular people. Supportive, hilarious, incredible, brilliant people who dig me as much as I dig them. All this, despite some major across-the-board downsizing over the last twelve or so months. This isn't the worst way to end a year, especially one we embarked on without much more than the determination on our backs. So, Santa, your work with me is done this year. Save the cashmere gift set for the next gal. I'm cozy enough as I am. But, if you could throw in an extra tiara or set of crayons for the Little One, she'd be so happy, she'd probably write you a thank you note. All by herself.